MiraCell® is a perforated cellular confinement system engineered from HDPE sections for maximum performance. MiraCell® is available in a number of depth and cell opening combinations. MiraCell® is supplied in a folded configuration that minimises transport costs to site yet can be readily expanded on site for very quick installation. MiraCell® has been perforated to ensure that each cell does not become water saturated during use. 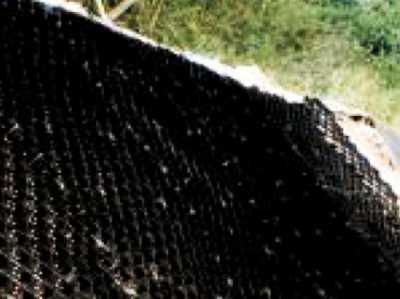 Slope Protection: The cellular configuration allows for effective protection and resistance to downward migration of slope materials due to hydraulic flow events. The cell is very effective at retaining soils within the cell structure in applications of cut slopes and where the natural cut materials cannot support vegetated slopes. Imported soils placed within the cell create an improved environment for vegetative growth and as such soils are confined, there will be increased resistance against possible movement down the slope. 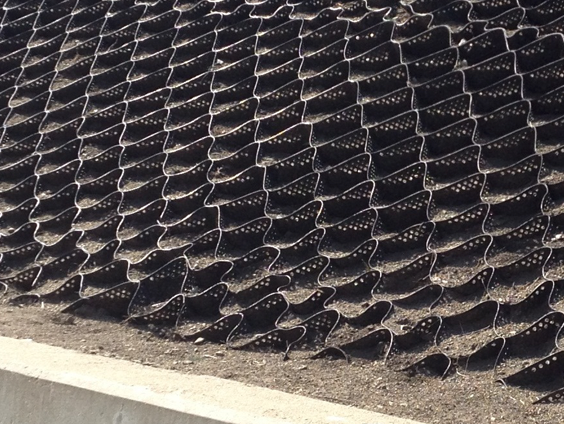 Channel Protection: The cellular configuration improves the hydraulic performance of conventional protection materials such as placed aggregate. By confinement of the aggregate within the cell an effective increase in the shear resistance of the placed aggregate is obtained. Channels that use MiraCell® are capable of larger flow events. Base Stabilisation: The cellular confinement of base materials in a road application increases resistance to lateral displacement of conventional road base materials. The use of MiraCell ® reduces rutting of the pavement and can increase pavement life. Part of existing Shot Crete wall along Airport Highway collapsed due to soil erosion underneath the concreted surface. Surface water runoff from the adjoining hill and water infiltration has caused gradual removal of soil through the cracks in concreted surface until it failed.